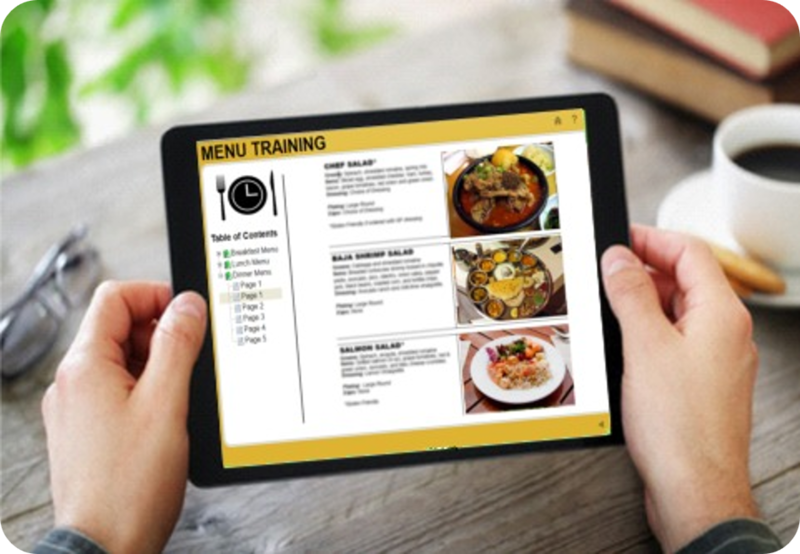 With Dupont Learning’s low-cost, automated approach – Menu Training Made Easy, employees log into using iPads or smart phones to take menu training – and tests. Are you still using pencil and paper to test your employees about your menu? And then do you score the tests manually? Do you hand new employees a menu, have them shadow an existing employee, and hope for the best? How about menu changes, new roll-outs/special promotions, and other important policies? How do you conduct that training? A thorough understanding of menu items, ingredients, and how meals are prepared reduces food waste, delays in service, and unhappy customers. The restaurant industry has been a late adapter of e-learning and online training. Why? We suspect it’s a combination of time, cost and the frequency at which menus change. Consider Dupont Learning’s low-cost, automated approach – Menu Training Made Easy. Employees log into an online platform (branded for your restaurant) through their own mobile device to review pertinent documents (menus, uniform standards, policies, etc). Changes are updated by overwriting old documents for new, and your changes are populated real time into your online training. Employees then take a quiz to verify their understanding. Scores are calculated online, and managers/owners have instant access to results. Also, if you want to really know what your servers are just not getting, you can drill down to the questions most frequently answered incorrectly. The result — less time training, consistent messaging, more accurate ordering, less food waste, increased speed to service, and a more pleasant dining experience for customers.